We plan to bring in the new year with a BANG – the bang of hammers and nail guns. Yesterday we poured the concrete and set the piers for a new house we plan to begin framing next week. 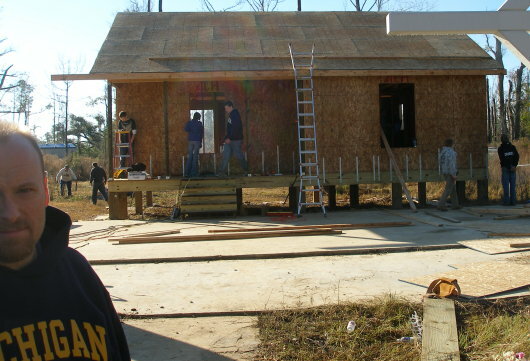 Over the weekend our friends from Michigan framed up a new house in less than three working days. They rolled in Friday afternoon and by the time I made it over to the site a couple hours later, they had already erected three of the exterior walls. They worked so fast, I didn’t even make it over to the site to snap pictures of the trusses going up. The teams working with us in December 2007 included folks from 10 states and 1 foreign country. We can’t thank these folks enough for their hard work, dedication, and long term commitment to the ongoing rebuilding efforts. Just one minor comment. Grace Evangelical Congregational Church in Pennsylvania is not located in Oil City, PA, it is located in Ninevah, PA, which does not have a post office…….so our address is Knox, PA. No biggie but enough that we’d like Knox…..and Ninevah recognized. This is the first time I’ve been to this website, mainly because my son is taking a “young” team down for next week. This is the first time he’s done anything like this and all but one of the group is in their 20’s, so this will be quite an experience for them. However, they have eager servant hearts and will do the best they can at what ever task they are assigned. All three of our children will be travelling in the same van along with two others. Several teams from our church have made the trek to Lakeshore and have come home immensely blessed. May God continue to watch over your community and Lakeshore Baptist Church. Thanks for the clarification Deb. Someone from the church gave us “Oil City” as the location. I corrected it here on the site, and I’ll check to make sure we have the right mailing address. Kyle Jefferies is not an Auburn group. He is an Athens, Alabama group. Please change on the web page. Sorry about that Robert. We know Kyle Jefferies is from Athens. Thanks for catching our typo. btw, Lord willing, I plan to preach up that way in a couple of weeks; in the Friendship Baptist Association. That was not the Kyle Jefferie group,It is The Limestone Baptist Association which Kyle is the Disaster Relief Coordinator.and should be recorded as such. You are correct. For consistency, I should list the group name and not just the leaders name. Usually we have individual church groups listed. since Kyle led a team from several churches we just used his name. We didn’t mean to slight anyone else by doing so. We should have asked him to list all the churches represented in this trip. I’ll try to do so next time. The Limestone Baptist Association has ben a tremendous help from early on after the storm.